It’s no secret that I have both amateur and professional interests in bees, bee health and beekeeping. During the weekend I sweat profusely in my beesuit, rushing between my apiaries in Central and Eastern Fife, checking my colonies – about 15 at the autumn census this year – averting swarms, setting up bait hives, queen rearing and carrying bulging supers back for extraction. Actually, not so much of the latter in 2017 🙁 I did get very wet though, much like all the other beekeepers in Fife. 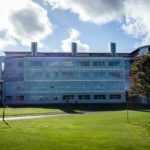 During the week I sit in front of a large computer screen running (or sometimes running to keep up with) a team of researchers studying the biology of viruses in the Biomedical Sciences Research Complex (BSRC) at the University of St. Andrews. Some of these researchers work on the biology and control of honey bee viruses. During the winter the beekeeping stops, but the research continues unabated. The apiary visits are replaced with trips in the evenings and weekends to beekeeping associations and conventions to talk about our research … or sometimes to talk about beekeeping. This weekend I’m delighted to be speaking at the South Devon Beekeepers Convention in Totnes on the science that underpins rational and practical Varroa control. I’ve been a virologist my entire academic career, but I’ve only worked on honey bee viruses for about 6 years. I’ve been a beekeeper for about a decade, so the beekeeping preceded working on the viruses of bees. However, the two are inextricably entwined. 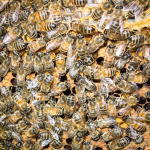 Having a reasonable amount of beekeeping experience provides a unique insight into the problems and practicalities of controlling the virus diseases that bees get. Being able to “talk beekeeping” with beekeepers has been very useful – both for the communication of our results to a wider audience and in influencing the way we approach our research. Increasingly, the latter is important. Researchers need to address relevant questions, using their detailed understanding of the science to deliver practical solutions to problems1. There’s no point in coming up with a solution if there’s no way it’s implementation is compatible with beekeeping. 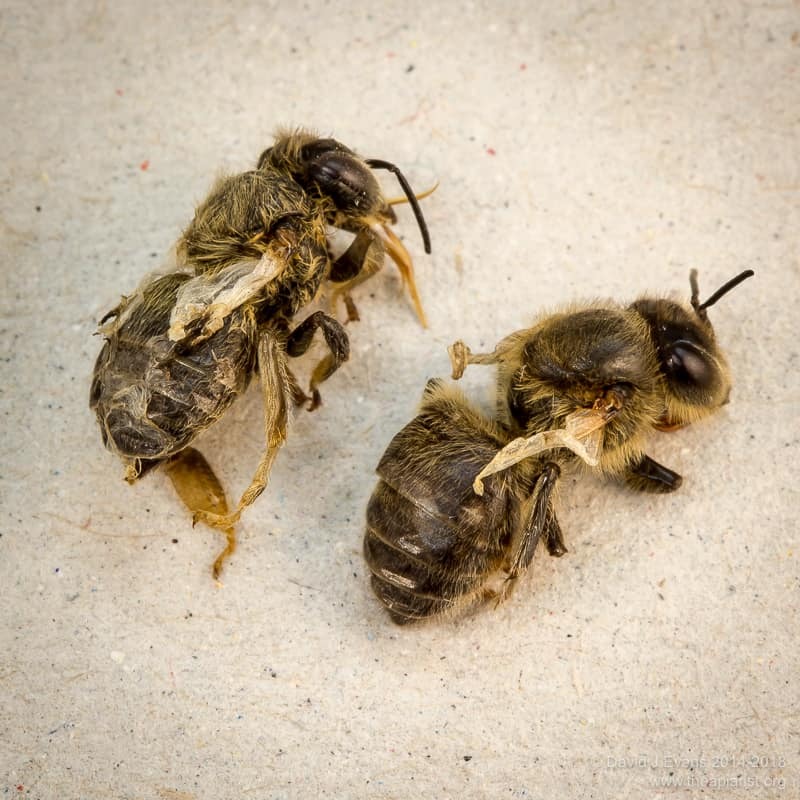 The most important virus for most beekeepers in most years is deformed wing virus (DWV). This virus “does what it says on the tin” because, at high levels, it causes developmental defects in pupae that emerge with shrivelled, stunted wings. There are additional developmental defects which are slightly less obvious, but there are additional (largely invisible) changes which are of greater importance. DWV reduces the lifespan of worker bees. This is probably not hugely significant in workers destined to live only a few weeks in midsummer. However, the winter bees that get the colony through from September through to March must live for months, not weeks. If these bees are heavily infected with DWV they die at a faster rate. Consequently, the colony dwindles and dies out in midwinter or early Spring. At best, it staggers through to March and then never builds up properly. It’s still effectively a winter loss. Our research focuses on how Varroa influences the virus population. There’s very good evidence now that DWV transmission by Varroa leads to a significant increase in the amount of virus, and a considerable decrease in the diversity of the virus population. Well, this is important because if we want to control the virus (i.e. to reduce DWV-associated disease and colony losses) it must help to know the proper identity of the virus we are trying to control. It will also help us measure how well our control works. We know we’re measuring the right thing. We’re working with researchers around the world to define the important characteristics of DWV strains that cause disease and, closer to home, with entire beekeeping associations to investigate practical strategies to improve colony health. We’re about to start a large collaborative project on the biology and control of chronic bee paralysis virus (CBPV). 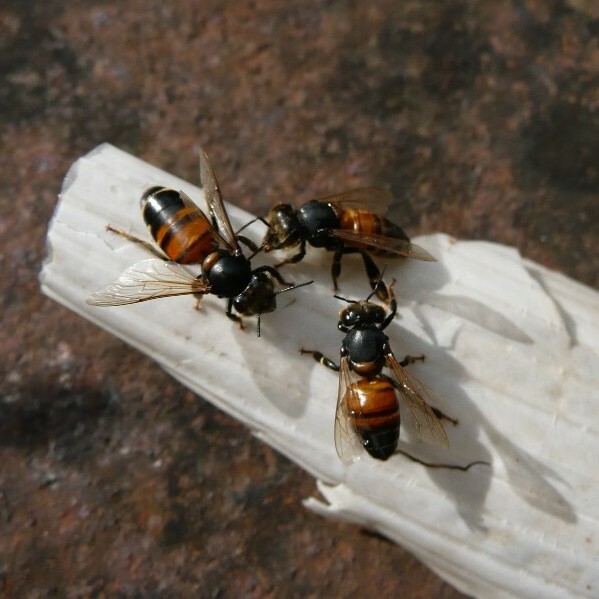 This virus is becoming a significant problem for many beekeepers and is increasing globally. It’s a particular problem for some bee farmers. 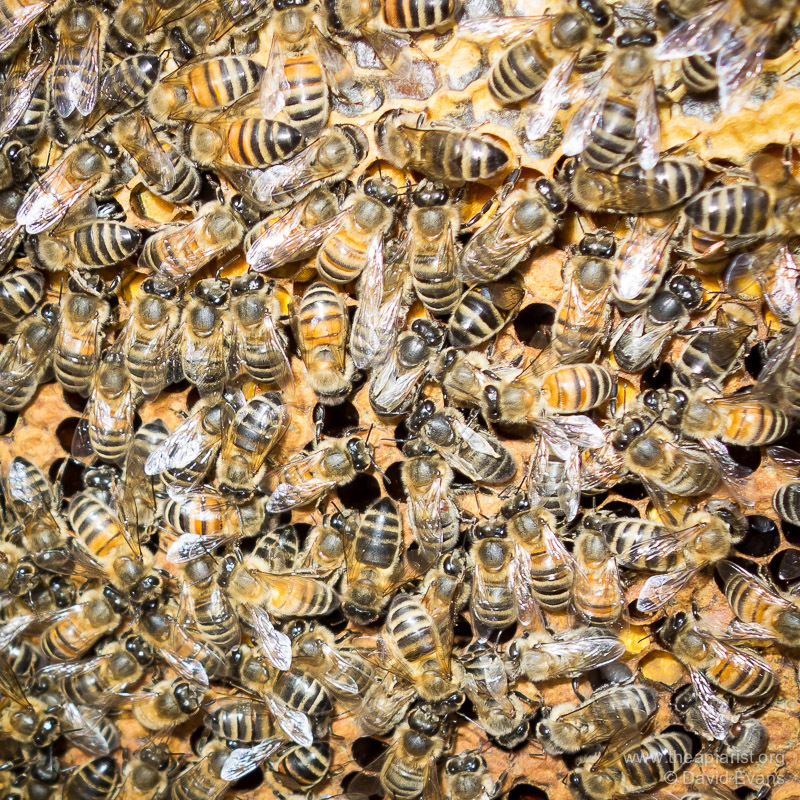 CBPV causes characteristic symptoms of dark, hairless, oily-looking bees that sometimes shiver, dying in large smelly piles at the hive entrance. It typically affects very strong colonies in the middle of the season. It can be devastating. Hives that should be the most productive ones in the apiary fail catastrophically. Why is a virus we’ve known about for decades apparently increasing in the amount of disease it causes? 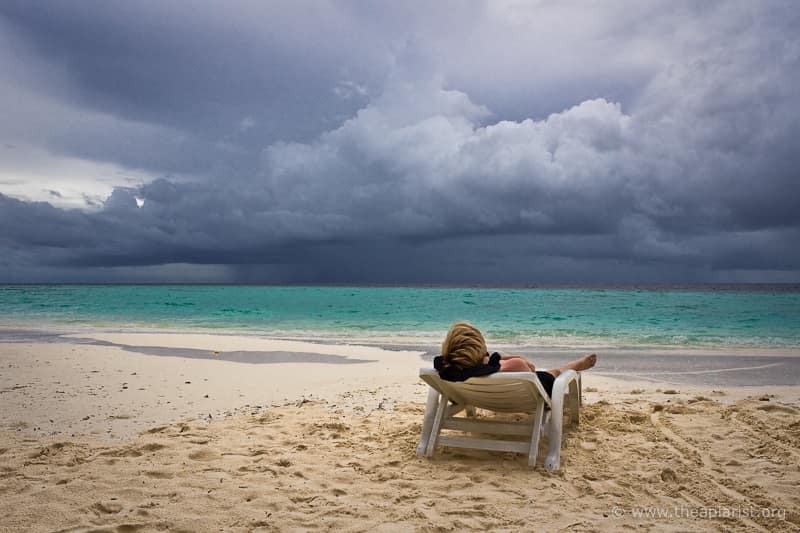 Are there new virulent strains of the virus circulating? Are there particular beekeeping practices that facilitate it’s spread? We’re working with collaborators in the University of Newcastle to try and address these and related questions. I’ll write more about CBPV over the next year or so. It won’t be a running dialogue on the research (which would be crushingly dull for most readers), but will provide some background information on what is a really fascinating virus. As virologists, we approach the disease by studying the virus. Although we maintain an excellent research apiary, we don’t do many experiments in ‘the field’. Almost all the work is done in test tubes in incubators in the laboratory … or in bees we rear in those incubators. 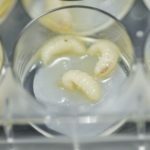 We can harvest day-old larvae (or even eggs) from a colony and rear them to emergence as adult bees in small plastic dishes in the laboratory. We use an artificial diet of sugar and pollen to do this. It’s time consuming – they need very regular feeding – but it provides a tightly controllable environment in which to do experiments. Since we can rear the bees, we can therefore easily test the ability of viruses to replicate in the bees. Do all strains of the virus replicate equally well? Do some strains outcompete others? Does the route by which the virus is acquired influence the location(s) in the bee in which the virus replicates? Or the strains it is susceptible to? Or the level of virus that accumulates? We can even ask questions about why and how DWV causes deformed wings. Again, so what? We suspect that DWV causes deformed wings because it stops the expression of a gene in the bee that’s needed to make ‘good’ wings. If we can identify that gene we might be able to investigate different strains of honey bee for variation in the gene that would render them less susceptible to being ‘turned off’ by DWV. That might be the basis for a selective breeding project. It’s a simplistic explanation, but it’s this type of molecular interaction that explains susceptibility to a wide range of human, animal and plant diseases. Bee health is important, and not fundamentally difficult to achieve. There are some basics to attend to … strong hives, good forage, good apiary hygiene etc. However, it primarily requires good powers of observation – does something look odd? Are there lots of mites present? How does the brood look? If things aren’t right – and often deducing this means comparisons must be made between hives – then many interventions are relatively straightforward. The most widespread problems (though, interestingly, this doesn’t apply to CBPV) are due to high levels of Varroa infestation. There are effective and relatively inexpensive ways to treat these … if they’re used properly. Regular checks, good record keeping, comparisons between hives and informed observation are what is needed. Don’t just look, instead look for specific things. Can you see bees with overt symptoms of DWV? Are there bees with Varroa riding around on their backs? The photo above has both of these in plain view. Are some hairless bees staggering around the top bars with glossy abdomens, or clinging to the side bars shaking and twitching? I’ve no doubt that scientists will be able to develop novel treatments to control or prevent virus infections of bees. I would say that … I’m a scientist 😉 However, I’m not sure beekeepers will be able to afford them, or perhaps even want to use them, or that they’d be compatible with honey production or of any use in Warré hives etc. I’m also not sure how soon these sorts of treatments might become available … so don’t wait. If there are signs of obvious DWV infection you need to do something. ‘Obvious’ because DWV is always present, but it’s usually harmless or at least tolerated by the bees. My lab have looked at thousands of bees and have yet to find one without detectable levels of DWV. However, healthy bees have only about 1/10,000 the level of DWV present in sick bees … and these are the ones that have obvious symptoms. I’ve discussed Varroa control elsewhere, and will again. Unfortunately, if your colony has signs of CBPV disease then Varroa control is not really relevant. The virus is transmitted from bee to bee by direct contact. This probably accounts for the appearance of the disease primarily in very strong colonies. At the moment there’s little you can do to ‘cure’ a CBPV-afflicted colony. I hope, in 2-3 years we will have a better idea on what interventions might work. We have lots of ideas, but there are a lot of basic questions to be addressed before we can test them. The half of my lab that don’t work on bee viruses study fundamental mechanisms of virus replication and evolution. They do this using human viruses, some of which are distant relatives of DWV. They work on human viruses as it’s only these that have excellent model systems to facilitate the types of elegant experiments we try to do. They’re also relatively easy to justify in funding applications, and it allows us to tap into a much bigger pot for funding opportunities (human health R&D costs probably total £2 billion/annum, bees might be £2 million/annum). And no, my lab don’t get anything like that much per year for our research! Importantly, the two activities on human and honey bee viruses are related. Our experience with the human viruses related to DWV made us well-qualified to tackle the bee virus. They replicate and evolve in very similar ways, we quantify them in the same way and there may be similarities in some ways we could approach to control them. And with the bee viruses I can mix business with pleasure. If I’m going to the apiary I’ll get to see and handle bees, despite it being officially “work”. It doesn’t happen as much as I’d like as I’m usually sat behind the computer and all of the ‘bee team’ have been trained to work with bees by the ESBA. However, at least when I talk to collaborators or to the beekeeping groups we’re fortunate to be working with we – inevitably – talk about bees. 1 Several years ago I delivered an enthusiastic and rather science-heavy talk at a Bee Farmers Association meeting. I thought it had gone reasonably well and they were kind enough to say some nice things to me … and then I got the question from the back of the room which went something like “That’s all very well young man … but what have you made NOW that I can put into my hives to make them healthy?”. I’m sure my answer was a bit woolly. These days the presentation would have had a bit less science and bit more justification. We’ve also made some progress and it’s possible to now discuss practical strategies to rationally control viruses in the hive. It’s not rocket science … though some of the science it’s based on is reasonably fancy. This entry was posted in Beekeeping, Science and tagged bee shed, boffins, CBPV, DWV, laboratory, mites, research, Varroa on October 27, 2017 by David. I will be very interested in the CBPV work you are doing and will be keeping an eye out for any developments. As a bee farmer we did suffer a few years ago but not recently. (Not sure why). I know a few colleagues who have suffered really badly as well. Keep up the good work. We’re well aware of the problems faced by some bee farmers recently. Why the prevalence is increasing is unclear but we hope to have some answers over the next year or three. Nice post! One of our local beekeepers has had a mite apocalypse in spite of a thymol based treatment in late summer, and the first thing he noticed was large numbers of DWV affected bees emerging and dying. I am hoping the gene manipulations techniques now coming online will more effectively target the Varroa mites, to at least control if not eradicate their populations in honey bee hives. Targetting Varroa With RNAi is fancy technology. I suspect that eradication is too much to expect but, if used widely enough and applied properly, could be beneficial. In the meantime though there are ways to tackle mites … and good observation and prompt action should avoid the mite apocalypse you describe. You’re down my end of the country! Good luck with your research, DWV is a big one that affects most beekeepers so any insights are useful. Thank you for your research and your educational blog articles. Once I shunned the presentation of another article or bee meeting related to the topic of Varroa or the accompanying viri. Now I make it a point to attend and read everything I can. I have this thought that one day we’ll conquer the Varroa mite and stop its spread of the viral diseases. Then, perhaps we’ll see a return to honey bees flourishing. Again, thank you for your efforts (day job) and your blog articles. I also hope that Varroa can be defeated but am increasingly realising it will require a combination of appropriate treatments and better beekeeping. As a scientist I know that there are solutions that could – with sufficient investment and development – be introduced. Whether they’re really needed is perhaps questionable … we increasingly understand what causes colony losses and we already have some pretty effective miticides. If used properly, Varroa is manageable. However, are beekeepers prepared to modify their beekeeping practices to do this? Really good. When stuff happens to the health of bees, I’m reminded of the limited resource available to discuss the issue. It’s just so good to have access to cutting edge bee research. As well as getting really up to date information on bee health and practical advice. Science is relatively slow and expensive … it takes time to conduct properly controlled experiments that definitively give a meaningful answer. It takes even longer to do field-based studies looking at the influence of management or control methods. There’s a lot of nonsense talked bout honey bee viruses, and a huge amount of very basic things that we don’t know yet. When you read or listen to what’s being done it’s worth trying to discriminate between observational studies which report what is found with experimental studies which test a hypothesis. My lab predominantly try and do the latter as they’re more informative overall. But, they take longer and they cost more. In the meantime, as I try and make clear on this site, there are simple and inexpensive solutions that can be applied now to improve the health of our bees. And by now, I mean last month (!) as it’s a bit late in the season to be applying Varroa treatments this autumn.